I trained at Goldsmiths College. The training was intense; combining theoretical and experiential work, at Postgraduate Masters degree level and completed over three years. All students are required to be in weekly personal therapy throughout the training. Art Therapists’ clinical work is supervised either weekly, fortnightly or at a minimum monthly, depending on experience and the amount of patient/client weekly contact. Art Therapists undertake Continuing Professional Development (CPD). The renewal of State Registration is linked to demonstrating achievement of professional competences. It is illegal to practice as an Art Therapist or Art Psychotherapist in the UK unless registered with the HCPC. Where do art therapists work and who with? Art therapists work with people individually and in groups in a range of settings including; schools, Child and Adolescent Mental Health Services (CAMHS), the NHS, social services, hospices, prisons and in private practice. The NHS is a key employer, followed by Social Services and Local Authorities (schools). As part of the Allied Health Profession art therapists are employed within the NHS on Band 7 – Band 8a (depending on experience). My clinical experience as an art therapist has developed through working with children, families and teenagers, and with adult men. I have worked within a school setting, NHS paediatric hospital setting as well as in intensive psychiatric care/mental health settings. I also have some experience of working as an art therapist within dementia care. Using art to explore the world around us and to start expressing our thoughts and feelings is powerful. It can be an exciting way for children, young people or adults to interact, make choices and piece together and understand their own personal story. Doing this within a therapeutic space that feels safe in which the art therapist holds the boundaries and develops a trusting relationship (carefully, over time) can bring about positive change and transformation for all involved. For example, internal conflicts which may arise during adolescence can be explored non-verbally through making images or objects which helps to make sense of thoughts and feelings that are too painful to speak about. Sometimes these confusing, painful thoughts and feelings are negated, repressed or are turned into impulsive of aggressive action against the self or others – ‘acting out’ through alcohol and substance misuse, mood swings, anorexia, cutting and other self harming behaviour including attempted suicide. I am passionate about supporting children, young people & adult’s positive mental health and emotional well-being. In our contemporary culture young people’s experiences can lead to confusion and isolation – and vulnerability to suicidal feelings and self harming in particular is of real concern. There are many competing pressures and at times this can be really hard to navigate, especially if sometimes you feel like you’re doing it on your own or you just don’t seem able to tell anyone. Art therapy offers a safe space to start exploring and understanding what’s going on – how you are feeling and where aspects of your day to day life might be causing some problems in some way. Using materials like clay, paint, charcoal and pens to create something or just to doodle and play can help to start to get in touch with how you’re feeling. Sometimes it’s easier to make an image or an object that connects with something you’re feeling inside rather than find the words to talk about it. The image or object can open up a space to start to understand. 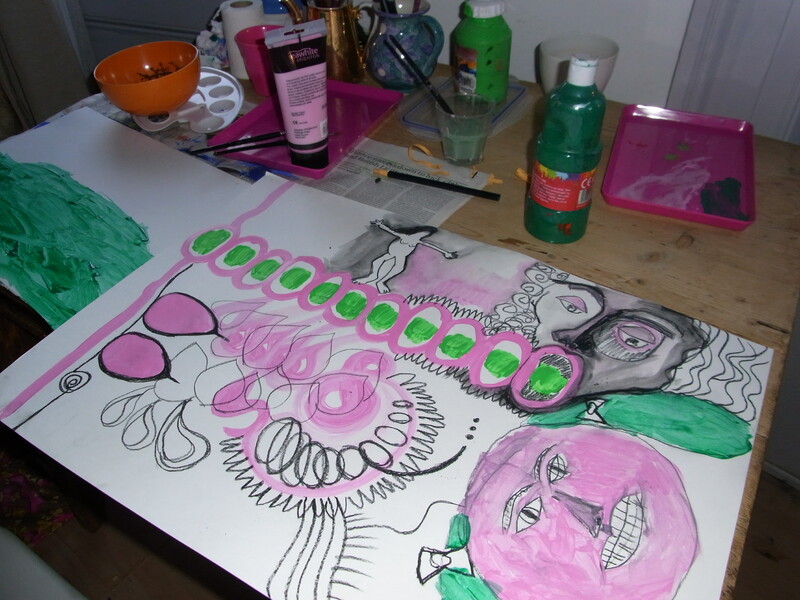 Art therapy sessions are offered weekly on one to one basis or as a group. One to one sessions usually last between 50 minutes and an hour. Groups last 1.5 hours – 2 hours. A group can be a place to share difficult thoughts and feelings with peers without having to worry about being judged or how others might react. There are no expectations, no getting it right or ‘behaving well’. It’s a place where all feelings can be explored including those that at times might be more difficult to accept or show – like anger, jealousy or hopelessness. Being part of an art therapy group can help a young person to explore difference, feel less isolated and better understood. Children and young people may also develop their confidence and ability to trust others as well as begin to value their own feelings and experiences more.